Visiting the Upper Paleolithic era decorated caves and rock shelters along the Dordogne, Vézère, Lot and Célé rivers in southern France was a scenic biking interlude. As often is the case in France, back roads with little traffic were easy to come by on the rolling farmland between the rivers. Through the millennia these rivers slowly carved distinctive undercuts in the limestone, some of which were used by the Paleolithic people from 35,000-10,000 bce as the starting point for simple shelters. And even today, houses are built under these overhangs using the rock wall as 1 or 2 sides or part of the ceiling. As we biked along, we often looked up at old post holes in the stone where a presumably modern structure had capitalized on the rock walls before the road was put in or was widened. 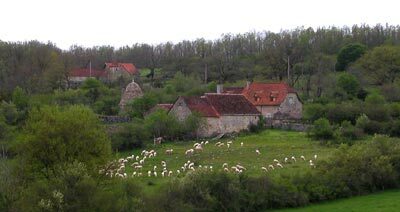 Homestead and sheep flock in the hills of the Dordogne. But along with looking up at the carved limestone overhangs, we looked down at the water level, as most of these rivers seemed to be at least 3-4’ above their normal depth, judging by the hundreds of partially submerged tree trunks we saw each day. The swampy areas along the road looked like they weren’t normally so wet and the river color suggested significant flooding somewhere upstream, as the reddish, chocolate-milk look of the water matched the color of the tilled soil in the adjacent fields. Fortunately, the water levels started dropping just before we left the region, so Bill was spared planning a great escape from the floods as he had to do in the summer of 2002. We left the lush river valleys and prehistoric decorated caves behind us and turned north with our sights set on Paris. Paris hadn’t been in the plans for this year, but our frustration with the regional museums in southern France nudged us to satisfy our yearnings elsewhere. We used the references in the general book on prehistoric art that had amply supplemented our decorated cave education to identify the museums with the most intriguing pieces. We knew the 2 week ride to Paris lacked much in the way of special sites to track down, so we contented ourselves with admiring the shades of purple in the blooming wisteria, lilacs, and iris and checking out an occasional church worthy of mention our guide books. 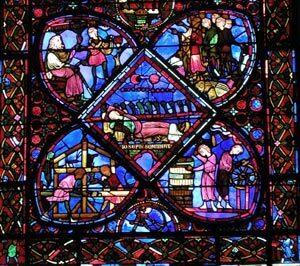 Vibrant stained glass at Bourges cathedral. It was springtime and the “puppies” were out: colts so precariously balanced on overly long legs that they look scared to move; snowy white lambs clumsily experimenting with a first frolic; and redwood-colored calves curled up in the grass like dogs or standing close to mom. We always slowed or stopped to admire the young ones if we could do so without upsetting the pack—sometimes they ignored us and other times one or more would tense from our attention. 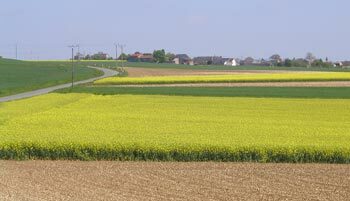 The idyllic countryside scenes were occasionally tarnished by spotting clusters of some of the almost 60 nuclear plants on the horizon that supply 75% of France’s electrical power. We always nervously joked about not stopping for lunch downwind of them but would pedal a little farther to an upwind location. And we were startled by the unexpected Southern California look that the wildly popular in-ground swimming pools were giving pockets of southern France. The bright marine blues and whites of the residential pools were oddly juxtaposed with the unpretentious, rustic stone farm houses. An assortment of holidays had made finding lodging difficult since leaving Spain. We had been traveling at the tail-end of the drawn-out Easter holidays and then encountered 5 other holidays over the next 6 weeks in France. The national holidays of Workers Day, 8th of May (celebrating the end of WWII), and Ascension Day were relatively easy to decipher but there were a few others that we never identified but were sufficient cause to shut down some hotels and all of the grocery stores in a given area. Approaching Paris from the decorated caves region only added to our problems as it set us up to ride north through a tourist-wasteland of France: an area of little interest and therefore of little tourist information. That meant that our guide books infrequently described the towns and regions and left us with a shortage of hotel information. And France is one of those countries where tourist info often isn’t of much help for the next town, only the town you are currently in. Bill’s daily route planning is always built around his knowledge of the next several night's lodging possibilities but suddenly we had too little information and were running the risk of being without accommodations for the night. We rarely head-out in the morning just hoping a place to stay will appear and that bias was reinforced as we alternated between towns where all but 1 hotel was still closed for the winter and towns where all the hotels were “complete” or full. Once we were shut-out by an international gymnastics’ conference in an unlikely community, but the other times we were clueless as to what was filling the hotels on the week nights. On those ‘complete’ nights we headed for the biggest road out of town that wasn’t a freeway until we found a cluster of chain hotels where we often got the last room. We were lucky that such clusters even exist in France as that strategy doesn’t work nearly as often in Europe as it does in the States. Panorama before entering the Loire valley. Bill finally resigned himself to using his scant resources to first locate a few hotels in striking distance and then planning our route--gone were the days of selecting the most pleasant looking route and then finding convenient lodging. He also very unhappily reconciled himself to calling ahead (my tiny French vocabulary wasn’t up to the challenge) to make reservations for every single night’s stay for the rest of our time in France, learning that calling 3 days in advance often wasn't enough lead time. It was a frustrating and disappointing rigidity imposed on our traditionally more spontaneous traveling style and required many unwelcome route changes. In the past, we had learned that Saturday nights in August might be tight for lodging, but never before had lodging been such a daily problem in May and June. This new routine also found us more often spending the night in a room with bilious bathroom tile, mildewing and peeling wall paper, and rickety furniture than we’d ever experienced outside of eastern Europe—but at western European prices. It also meant spending more nights in hotels bracketed by noisy freeways--something we've never done before in Europe. 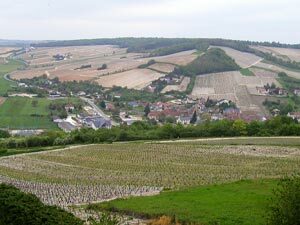 Map Man had gone back and forth as to whether to lengthen our journey to Paris by traveling the much touted, scenic Loire ("la-wahr") River Valley or saving it for the focus of a future visit. He finally he settled on the intermediate solution, which was traversing part of it. It was pretty but it didn’t take us long to decide that it wasn’t THAT pretty. We hail from a beautiful part of this planet and have traveled some delightful river ways in Europe and the Loire was a long way from being on the Top 10 of our list. Even though the Loire didn’t dazzle us, we did enjoy watching the subtle changes in the scenery as we approached the Loire River, traversed part of it and then headed on our way north again. It began with pasture land in hilly country with the ever welcome roadside companions of cows and sheep. The elevation changes in the hills leveled out a bit and grains and blooming cover crops appeared. And as we approached the plains area around Chartres cathedral south of Paris, it became even flatter yet with grasses revealing their more mature cereal crops and the cover crops were now sometimes over 5’ high with just-fading blooms. And as we hit the plains, the farm land began to be more densely populated and we were never out of sight of some village’s pointed, black slate church steep or looming water tower built in the 1930’s. 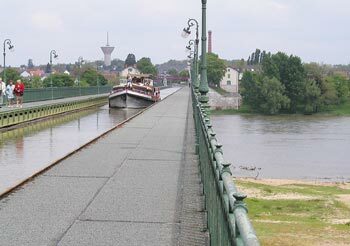 The Pont Canal built over the Loire River. The big tourist event for us in the Loire area was seeing and walking on the 'banks' of a barge canal that was built over a river—like a freeway overpass filled with water. Pont Canal is a part of the Loire Lateral Canal and crosses the Loire River at the town of Briare on an aqueduct built from 1890 to1894. It is in the Art Nouveau style and was designed by G. Eiffel of the Eiffel Tower fame. Its raised channel is the longest in the world at 2,174’ and it rests on 15 granite piers. (And for those of you who remember Archimedes’ principle, the load on the piers is constant irrespective of the presence of barges or the weight of their cargo). Our photo-op wish was granted as several boats traversed the canal while we were there. Unfortunately, just after taking one of the photos, I dropped the camera and that was the end of its traveling season with us. Our trip to Paris had been for the sole purpose of visiting 3 museums with the finds from the painted caves in the Perigord region, but a new camera or a camera repair was instantly added to the growing list of chores to do there. The Australian cyclotourist who warned us about the ferries to Iceland being sold out for the season had upped the urgency for buying a guide book for that country and spending a few hours doing research on the internet—both things we hadn’t planned on doing until we were in England. We also needed to replace our favorite, French-made camp cooking pot that was now shedding its Teflon lining and perhaps we’d find the seam seal we needed to re-waterproof our homemade over-mittens. The growing list of shopping matters made the unexpected Thursday holiday thrown in the middle of our anticipated Paris stay even more inconvenient and some of the fun was draining out of our Paris stop-over before we even arrived. We did our best to keep the looming problems in the background until we could directly address them in Paris and it helped to focus on the little daily pleasures. Finding a sunny or wind-sheltered place to sit for a cool-weather lunch does a lot to enhance our day and for one lunch it meant seeking shelter from the intermittent snow flurries. Treats in the market for this segment of the trip were the tasty purple grapes from South Africa and strawberries from Spain--both of which were cheaper than their French counterparts. As we got closer to Paris, we had a special traveler’s treat: a string of towns with public toilets. That of course is a luxury we have learned to live without but we welcome when available. These public toilets that often did not even have a sign over them ranged from squat toilets long overdue for cleaning to sparkling fresh, fully equipped facilities. It became a bit of a game to see if we could spot them in each town and we quickly learned to look for them within a block of the cluster of the town hall, post office and the public telephone booth. They were easiest to locate in the small communities where all of the public services were tightly consolidated and sometimes eluded us in the larger towns. In the same area where we had a few sidewalk chats, the choices and quality of bread skyrocketed, making us wonder if it was all coincidence or if we were in a region with a little different heritage. Most of the bread we’d bought in France was mediocre—not the fabled yummy baguettes but products that seemed to have suffered from pressure to keep the price down. But in this one area south of Paris we could choose from a half dozen, well-done specialty breads, like whole grain and cereal blends, in any given shop. The outgoing and friendly nature of many Spanish people continued to impress us, even in France. A couple of days south of Paris we stopped to admire the slim alabaster windows and small mosaic dome of a 9th century church and it was the Spanish woman who broke away from her group to come chat with us about our journey—in French. And a few days later as we were getting off a train in the suburbs of Paris, it was the young Spanish men that responded to Bill’s open question of “Is this the end of the line?” They quickly answered, gave him some general guidance as to how to get onto the next train, and proceeded to tap on the windows and gesture to the unknowing that it was time to get off the train as they walked along the platform. The French people just walked by, letting the unsuspecting sit on the train thinking it would continue on and not reverse it’s direction as it was about to do. What a contrast in cultures. Determined to make the best of having a national holiday in the middle of our brief Paris stay, I immediately began calling the museums on our list to learn if any or all of them would be open. I couldn’t believe my ears and made the first staff person repeat herself: they wouldn’t know if the museum would be open until after opening hours on the holiday. At that point, they would assess if sufficient staff reported to work to open the museum! The antiquities museum at St Germain-en-Lye in the outskirts of Paris did open its doors on the holiday and we filled an afternoon viewing its treasures. Unfortunately, they too were doing some renovation work and about a fourth of the museum was closed and one section of exhibits was in controlled disarray. We were disappointed to see that we’d have to continue to savor some of the 15,000 year old art in pictures only rather than seeing the real thing as we had hoped. 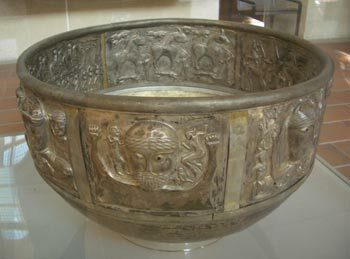 Though an unexpected treat was seeing a replica of a 1st century bce, 3’ diameter, silver-gilded Celtic cauldron found in a Danish peat bog that we had been admiring in our big book of Celts we bought in Spain. Visiting museums is a little like mining for gold: some days you go away empty-handed and hungry and once in a great while you hit the Mother Lode. The previous day at St Germain nourished us though wasn’t the hoped-for feast, but the next day at the Gallery of Evolution we unexpectedly hit the big one. The museum itself was quite a disappointment: the displays were fresh and attractive but it is definitely a kid’s museum with a Louvre-like focus of displaying stuffed animals but is very short on education. We read our history books while we reluctantly stood in line to see the special exhibit within the museum on mammoths, expecting another “ho-hum” experience. Indeed, the mammoth’s exhibit was also a very ‘young’ exhibit of primarily things to touch and manipulate. 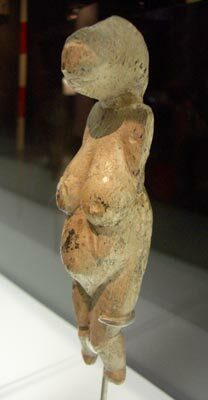 But right in the middle of the mayhem of classrooms of kids pouring through the room was a long, narrow display case of nearly 2 dozen carved ivory figurines from 10,000 to 32,000 years old. We were dumbfounded that this world-class collection of mostly fertility “Venuses” were plopped down in the middle of a kid’s exhibit in a museum targeted at kids. There was absolutely no mention of these famous Venuses, many that we recognized from the history books in our hands at the moment, in any of the publicity information about the special exhibit that we had seen. Almost half of these prized pieces were from the Hermitage in St Petersburg and at least 2 each from the Ukraine, the Czech Republic, Germany and Paris. We were horrified that we had almost missed this exhibit because of the long wait in line on the heels of a disappointing visit to the main part of the museum. The irony was that 2 of the Venuses that we expected to see in a different Paris museum the next day were here for the temporary exhibit. It’s these unexpected treasures that we occasional run across in museums that keeps us putting in the time. Generally we can only get very sketchy information about the content of museums before we walk through the door, so we make our best guess on which one’s to visit, pay our money (and time) and take our chances. But that long row of mostly 1-2” high prized ivory Venuses won’t quickly fade from my mind. Revisiting Paris was an interesting benchmark for us as we could see how we have developed as tourists. We were in Paris for 3 weeks our first year in Europe in 2001, only 2 or 3 months into our travels. We clearly have more confidence now, which cuts down on some of our frustration in the city. It’s the little things that keep the aggravation level down, like being able to return to a market and have an overcharge corrected and nudging the reluctant staff person to write down the list of metro/train changes instead of walking away not having understood his spoken instructions. And like in 2001, we were treated to the hospitality of a Portlander permanently residing in Paris. We squealed with delight when she offered us several “Zip-Lock” bags in a couple of different sizes and some bags of a favorite brand of spicy tea. It was amusing to see the sense of connection those little gifts created, but they potently signaled a deep understanding of what was missed from back home and created a moment of sharing a common history. We again savored a wonderful home-cooked meal from this woman who understands West Coast tastes, which this time included salmon, asparagus and a fruit cobbler. And it’s always refreshing to experience home life while we are on the road. We were fascinated to hear how the Portland-based Grandma, who is also a friend, reads to her almost 5-year-old Parisian granddaughter every Sunday night via the internet with the help of the special little cameras in each home. Our travels and peace of mind hugely benefit from the internet, but what a deeply touching way that this family is tapping into the power of the ‘net. But by the end of our 4th day in Paris my tolerance for the pulsing of the big city was seriously waning. The high-contact and confrontational sports of riding metros, walking on the sidewalks, shopping in the markets and visiting the museums left me longing for the calm and spaciousness of our cycling life. I don’t crave the solitude that some seek with backpacking, but spending so much of my energy defending my right to occupy space in the crowds and the shortage of tranquil moments definitely wears me down--I can do it, but I'd rather not. Unfortunately, I began tiring of Paris after 4 days, but it took another 4 days for us to wrap-up our business. But Bill left town with a new, faster and much smaller digital camera; we had the just-released, 2004 edition of an Iceland guide book tucked away in our panniers; and we had a skeleton plan laid out for our much-revised trip there. We would leave the city as we had arrived—by train—to avoid engaging with the very aggressive Parisian drivers. Once the train deposited us safely beyond the suburbs, we would pedal west to the more lush and culturally-distinctive region of Brittany. The old Olympus is on the left. Our first digital camera, an Olympus D40, was easy to use and took great shots, especially in low-light situations like museums. Our only regrets were that it was a little bulky and heavy as a constant occupant of Bill's fanny pack and it was a too slow and noisy for taking animal shots. Bill had restrained himself from replacing it this year with a new smaller and faster model when we were back home in the winter but an unfortunate fumble by me meant that he got to shop for an early birthday present for himself while in Paris. Our first inquiries about repairing it prompted the tiresomely predictable European response of "It's not possible." A second inquiry resulted in an upper estimate of $250 to repair it. After imagining all the scenarios of waiting to hear the cost of a repair, if one was possible, and then possibly having to return to Paris to either pick-up the repaired camera or buy a new one, we decided to cut our losses and just buy a replacement. We we mailed the damaged Olympus back to the States, hoping to repair it when we return in the winter. The new Pentax S4i is truly pocket-sized and is incredibly lightweight and small. It does not function as well as a "point and shoot" camera as the Olympus as it's easier to end up with blurred pictures. It also has more barrel distortion, which is when 2 parallel lines in the real world (like 2 lamp posts) tilt towards each other a bit in the photo. But Bill it loving the tiny size, the featherweight, and speed in which it snaps a shot, plus he is finding that accessing the many sophisticated functions inherent in digital cameras to be more intuitive than was the case with the Olympus. And Bill has been busy experimenting with ways to move the problems with the Pentax into the history books (at which point I'll start using it). Bill waiting with "the kids." Our new Continental TravelContact tires gave us a fright when Bill got his second flat tire on the 6th week of this year’s tour. We’ve gone years without puncture flats on our discontinued Continental Goliaths and so we were disappointed and horrified at the prospect of having so many flats now. But it is looking like it was just a bit of bad luck as after a total of 4 months of riding we haven’t had any more punctures. But wait: just before we sent this update out, Bill got a third, rear-tire flat. Three flats in 3,000 miles isn't an awful record in the biking world, but is much more than we have become accustomed to having occur. 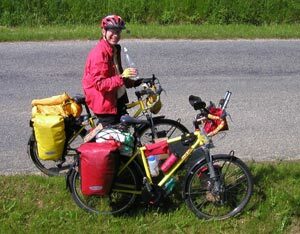 Our assessment that the weak point in Vaude panniers is their plastic backing has been reinforced by a second fracture. The first bit of shattering was on the edge of a brand new pannier during baggage handling when flying to Europe. The second break recently occurred on my pair that is a year older. The crack occurred on the center-back of the pannier where a large plastic hook secures the pannier to the rack. Bill was able to juggle the fit of the pannier onto the rack enough so that it isn’t under too much strain, but the plastic backing is definitely failing. The plastic on the Ortlieb panniers is heavier and we never had any breaks on them. The Ortliebs however have an inferior latching mechanism and the panniers had started flying off the racks as we pedaled down the road, causing us to switch to Vaudes. We absolutely love our disc brakes and comment on how secure they make us feel on steep descents, especially in the rain. A lot of the thrill in riding is gone now that we know we can bring those bikes to a stop whenever we want, but that wasn’t a thrill we relished. Our new bikes are so stable and solid and are absolutely delightful to ride and now we have more confidence than ever in the saddle with the better braking system. The disc brake pads seem to wear out at about the same rate as the conventional pads but are quite a bit more expensive, especially in Europe. We are partially financing a box being shipped to us in Europe by the savings we’ll reap from including 4 pairs of brake pads in the box. But we can buy the pads here if we need them and the brake pads have been easy enough to replace that Bill does them during an extended lunch break. We arrived by boat from Caen, France in Portsmouth, England on Friday, July 2. After some train travel and hair-raising biking, we left our bikes and biking gear with friends north of London in preparation for our 17 days in Iceland. We fly out of London on Monday morning, July 12, for Reykjavik, Iceland for an unfortunately non-biking tour of the country. After a dismal 2 weeks of next to no opportunities to connect our laptop to the internet, Bill bit the bullet and bought a wireless connection card for the computer. This website update will be his first via yet another connection option in his ever-expanding array of strategies. We don't expect to be able to use the wireless approach often as it will likely only be available to us in large cities, but we welcome the flexibility it offers.